Whenever I fly somewhere, I dream of just landing and riding my bike from the airport. I've been flying with my bike in tow for a couple of years now but, for a variety of reasons chronicled on this blog, that hasn't been practical. Until now...(cue Strauss' "Also sprach Zarathustra" from 2001: A Space Odyssey). Yesterday, I landed at Ontario International Airport, in Ontario, California (not Canada). I walked off the plane with two modestly-sized carry-ons. After retrieving a typically-sized suitcase from baggage claim, I walked to a quiet corner of the airport. In less time than it takes to rent a car, ~15 minutes, I was riding off from the airport with all my luggage and still cruising at 30kph. Better still, I incurred no additional baggage charges like I did in D.C. recently. fits in a regular suitcase. Incredible! Here's a link to my nycewheels review where I gush further. fits in a regular carry-on bag (included). Thanks to these innovations, it is a great time to be alive and cycling. Other folding bikes and trailers have come along but few fold/unfold as fast AND perform as well on the road. CHP, please avoid bike lanes. 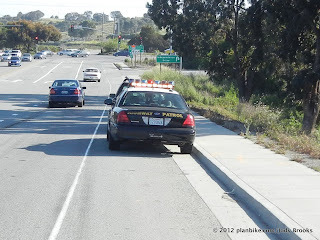 Dear CHP (California Highway Patrol). When stopping drivers, please guide them to a spot away from bicycle lanes. Forcing me around you risks my life and implicitly tells other drivers these lanes don't matter. In this example, I had to pull into a lane between cars going 40 MPH. I'm brave and all but this kind of thing dramatically increases the chances I'll be dead or maimed by someone looking at you as they drive past. Note the perfectly good turnout 50 yards ahead. You could have used that as the spot to write your citation. This would keep you from getting hit as well.